Week two of Camp NaNoWriMo feels a lot like week two of regular NaNoWriMo. I don’t have enough words and I hate every one that I’ve written. I’m convinced that my story is crap and that I have no writing ability at all. A voice in my head is telling me to give up but I will not give up. I know this is how week two always feels. The first year I participated in NaNoWriMo, I got behind on my word count because I decided to rest when I caught the flu. It was a good decision, but it meant that I got to late November and still needed way more than my planned two thousand words a day. Fortunately, Thanksgiving came early that year and I was able to take a make-up day on Black Friday. I don’t shop on Black Friday. My usual tradition is to eat leftover pie and watch Christmas videos. That year, I pulled out my netbook and worked on my novel while I was eating leftover pie and watching Christmas videos. By the end of the day, I had made up my word count. I was also full of pie and Christmas spirit. It was an excellent make-up day. I’m hoping to find one of those at some point during this Camp. I set myself a goal that I thought would be easy: thirty thousand words. I wrote fifty thousand words in November; how hard could thirty thousand be? I should learn not to ask those kinds of questions. I’ve finished eight days of Camp NaNoWriMo and only one of them was a thousand-word day. Some days, it’s a struggle to write five hundred. One day, I wrote no words at all. It was a holiday, so I figured I could take a break. Unfortunately, there’s no leftover pie after Independence Day. We make ice cream for Independence Day. There’s no pie and there are no uplifting videos to watch. I’m not in the mood to watch Emmet Otter’s Jugband Christmas in July. There’s another problem. All I want to do is paint. I spent most of this past week doing tie-dye inventory (we like to count things every quarter) and trying to work on my novel. The inventory is finally done. That should give me more time to work on my novel, but all I can think of is grabbing a canvas and splashing paint on it. No, it’s weirder than that. Suddenly, I want to make a big painting. It would be easy to do something with a tiny canvas, claim that I painted, and move on. When I decided to allow myself a little painting time today, I thought I would do that. Instead, I grabbed the biggest toned canvas in my studio (okay, I’m lying about the studio. All of my painting supplies are on the dining room table because my creative space is full of tie-dye) and I started to plan how I would paint it. 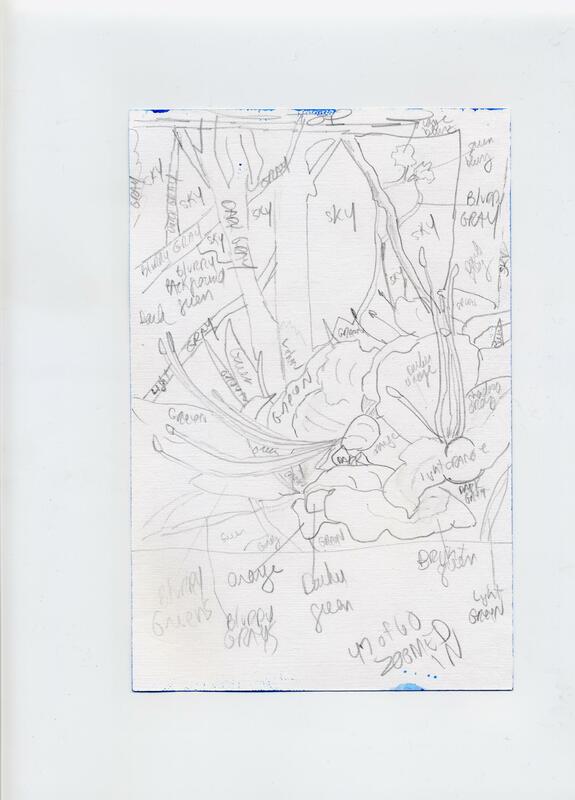 Yes, you read that right – I said “plan.” I did a detailed sketch, with color notes, before I added any paint to my canvas. All I could get done in the time I had left was a few bits of sky. It was the most boring painting session imaginable and I loved it. I can’t wait to get back to it. I don’t feel that way about my novel, but I know that’s normal for week two. I will paint, but I will also keep writing. I signed up for Camp NaNoWriMo. I chose to participate. I made a commitment. I will follow through. I will get my thirty thousand words, one way or another. I don’t know how I’m going to manage that right now, but I’m pretty sure the process will involve pie. This entry was posted in Uncategorized and tagged Camp NaNoWriMo, creativity, NaNoWriMo, painting, pie, writing on July 9, 2014 by releaf1954. I find that other forms of artistic stimuli often do the trick. If you want to paint, paint! You’ll get there. Thanks, Sarah. I like that advice. Keep with it! Week two is the worst. Haha I usually get the mopes and that makes week three terrible because I’m getting desperate trying to catch up, and I end up wildly pantsing week four. Either way, something about it is so much fun! Remember the fun parts, throw in a plot twist, paint a picture with your words by taking your characters somewhere beautiful, and keep on rolling!